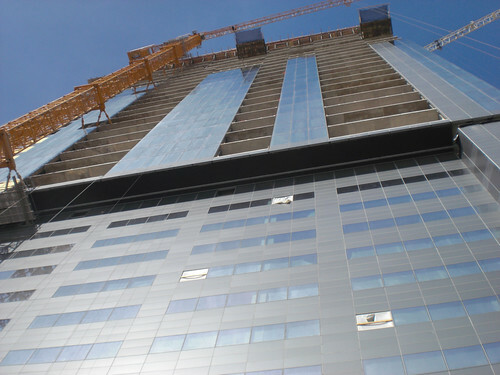 Over the weekend we were able to take a guided tour of downtown Austin’s Four Seasons Residences. What we have are raw snap shots of views, as captured in the middle of a construction area. Anytime a building provides access prior to completion I am especially grateful, and it speaks to their confidence in the project. Like our tour of the Austonian last week, it was requested that we not photograph the interiors until construction is complete, which we respected. You can get a sense for what the interiors of Austin’s Four Seasons Residences will look like here. As we see it, the Four Seasons is betting that true luxury buyers are seeking something warmer, more rooted in tradition and familiar with the Four Seasons brand, as opposed to the sleek monolithic aesthetic of the W, or the high profile of the Austonian. I’ve always been excited about this project, and the building did not disappoint. Smart layouts, impressive views, and most evident was the level of amenities that would come with home ownership. Being connected to the Four Seasons has its perks. The terraces are incredible in every unit. Unlike many buildings that provide terraces which do no more than defy you furnish one of them, these are large and airy spaces that could be used as outside rooms. The west facing terraces (above) were my favorites and are available with the Austin and Upper Combo West floor plans. Like Austin’s W Hotel Residences, the Four Seasons is oriented length wise along Lady Bird Lake. This orientation maximizes the desirable southern sunlight. Half way up the building, the views shift from living “in the city” to “above the city”. In my experience, there are buyers that seek out the former and the latter. In general, the lower floors will provide better value and a sense of living in the mix of city life. We’ve confirmed that the 11,000 ft penthouse (31st floor) of the building has been purchased for an undisclosed amount. We estimate ~$8-9MM [for the shell space] based on pricing released last year. Interestingly, it is rumored that as part of the deal the Four Seasons agreed to increase the height of the top floor, and perhaps the building, by two feet. Entire penthouse (31st floor) purchased. Estimated purchase price between $8-9MM for the shell space. Thanks to Ian Stonington for setting this up. Ian is a consummate professional that knows everything about his building, including the answers to the most esoteric questions, like “who makes the light switch?”. Did you enjoy this article? Share the love, we appreciate it! After several weeks of the weather foiling our plans, myself and KevinFromTexas at SkyscraperPage, were escorted to the 55th floor of the Austonian where we could take photos of the building’s city views (they kindly asked us to not take photos of the interiors until they were complete). As has been common this season, a storm started rolling in as we were setting up, and the wind was a little too intense for this photographer’s novice hand to get the tripod to support itself. I think we came through with some interesting perspectives. If you’re interested in more photos of the Austonian, make sure to checkout SkyscraperPage’s Austonian Thread and Flickr. Thanks to Cile, Sarah, and Trey at the Austonian for facilitating the tour! You can see the 55th floor terraces here – this amazing photo is taken from the crane positioned high above the top of the building! Dig these pics of the Austonian? Share the love, we appreciate it! Austin’s W Hotel’s monolithic gray & glass facade is arguably the sleekest and sexiest of the luxury bunch. DAB headed to the W Austin’s “topping off” party last night with hopes of snapping some view photos. Unfortunately, by the time the fire marshal allowed guests into the structure the sun had already set. Apologies for the dark photos, but you can still get a sense for the night time views from the 31st floor, including the new illumination on the Austonian. A few other downtown pics included from earlier in the day. Did you enjoy these pics? Share the love, we appreciate it!